The idea of going green is certainly a hot topic in 2019. As the effects of global climate change become more pronounced, many consumers feel it's important to do their part to protect the planet. But business owners have to consider their bottom line, often above all else. It would be nice to embrace more energy efficient and sustainable practices, but what if doing so would have a negative impact on operational costs? Embracing sustainable practices can actually allow your company to save -- significantly, in many cases. If you're able to streamline your business by eliminating (or being smarter about) your waste, you'll end up making your organization a whole lot greener without a lot of effort. Most importantly, you'll also be able to become more cost-efficient as a result. How Does Going Green Help Businesses Save Money? Making greener practices part of your regular operations can certainly improve your brand's image and even open up the possibility for tax incentives. Those two benefits alone might be enough to convince many business owners to opt for sustainability. But there are other financial advantages that come along with the eco-friendly route. You don't have to go to great lengths, either. When you use LED light bulbs and make an effort to improve energy efficiency, you're going to automatically reduce the frequency of necessary bulb changes and decrease your utility bills. That translates to less waste and lower costs -- all without making any noticeable sacrifice on your part. By making subtle changes to conserve electricity, you'll be able to divert those extra funds to areas that can allow your business to grow. The same concept applies to your waste management solutions. You may not like to give your commercial garbage bins a lot of thought, but you are throwing away money if you opt for standard trash collection. 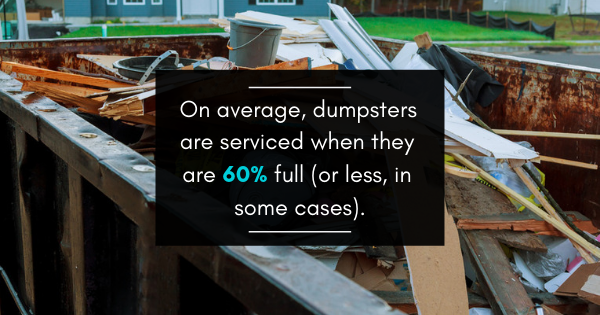 On average, dumpsters are serviced when they are 60% full (or less, in some cases). That means that you're paying too much and too often for waste removal services. Streamlining the way you get rid of waste can do wonders for your bottom line. Of course, reducing the amount of items that end up in the waste bin can certainly allow you to save money and save the planet. But so can taking charge of your waste management. By working with a waste removal service that can anticipate your unique needs, rather than opting for the standard procedures that often result in high costs and low efficiency, you'll be able to optimize your collections and lower associated costs. Over time, this can help your organization to reduce the amount of total waste produced, utilize more recycling practices, and divert those savings back into your business. Some business owners believe that becoming more environmentally friendly always involves drastic operations. Going paperless may work for some offices, but it's not a realistic goal for every business. If your business is unable to implement these sweeping changes, you certainly aren't alone. What's more, you don't necessarily have to conduct business in an entirely new way in order to go green or to save money. In many cases, small adjustments can be extremely effective. Swapping out your lighting options, being more conservative about your thermostat settings, or choosing a new waste removal service can allow your company to reach your goals in terms of both savings and sustainability. These changes may be subtle, but their lasting effects won't be. By working with a smarter waste removal service or reducing your electricity usage when business is done for the day, you'll be able to cut costs without cutting corners. The sustainability aspect will just be a plus. To learn more about how we can improve your commercial waste management, please contact us today.